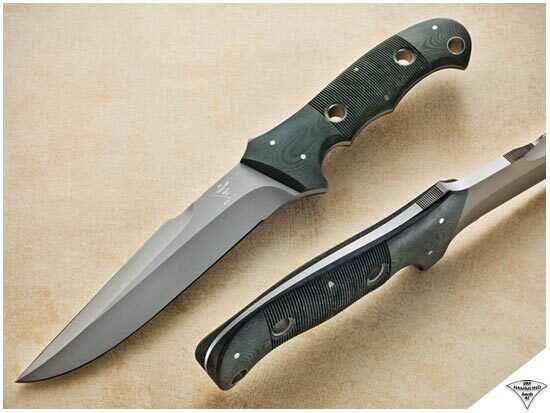 The newest design in the Hammond Knives arsenal of military combat knives is the Endurance. Compact, clean and concise—it is the next generation of tactical combat knives, oriented toward the ever-changing needs of the modern day warrior. The prototype models shown are the current phase of design evolution in the knife’s second generation of development. 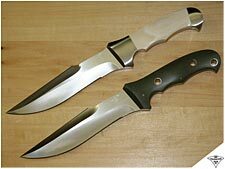 The original prototype was first evaluated by noted knife and martial arts authority, the late Bob Kasper. Bob and I first crossed paths at an early New York Custom Knife Show, and discovered a mutual connection with Arcenio Advincula, with whom I had created the Flesheater™. Bob was the founder and director of the Gung Ho Chuan Association and the Kni-Com knife-fighting system, teaching military, Department of Defense, government and corporate personnel throughout the world, as well as being a subject matter expert in establishing knife training for the Marine Corps Close Combat Curriculum. He then asked me, “Who did you design this with?” I simply told him that it was a coming together of all the years of feedback and review that I’d received doing developmental work on special warfare knife projects for the military. But even though Bob said not to change a thing, the Endurance has moved to the next level with subtle changes, adding even more to the knife’s overall versatility. The Endurance™ is a full tang design, incorporating a double hollow ground offset blade grind with a full tapered tang. The recessed area on the blade back between the aft end of the top grind and the front of the handle allows for added control and leverage in a working application. The feature at the rear of the top grind is called the “Navarro Hook™,” named for one of Advincula’s first instructors, Tony Navarro, who was a Filipino Scout. Navarro filed several barbs or hooks into the edge of the top grind of his combat knife. A person may not realize they’ve been cut by an extremely sharp knife so the design purpose for the hook is to catch and snag like a fish hook barb, for a more engaging contact with a back cut. Like other Hammond combat knives, the micarta handle scales are contoured for maximum comfort and control with both a palm and pommel swell. Three stainless steel lined 3/8” holes in the handle allow for added finger purchase and lashing capability as needed. The handle design allows for maximum versatility in either forward or reverse carry applications. Hand-filed vertical serrations on both sides of the handle are once again available as a custom option, and add significantly to grip purchase under extreme conditions. There is also a collector’s grade version available, as shown in the photograph below. Feel free to inquire as to the various options available with this upgraded styling. The Endurance is available in two blade styles: one has a straight lower main edge, and the other has a slightly distended curved lower main edge, like on the Flesheater. Endurance: “The power of continuing under pain, hardship, or distress without being overcome.” The name is exactly what a knife of this caliber must achieve for those who carry it in harm’s way.